The March 1907 Lovelock Tribune ran the story on the front page. It’s down-to-the-wire for the Battle Mountain High School Class of 2019, and senior students, their family and friends, and the Battle Mountain community and businesses have been working hard all year to raise money to purchase prizes for two celebrations, the Dessert Night and 50/50 Raffle on June 2, and the All Night Graduation Celebration on June 7. The National Prescription Drug Take-Back Day will be Saturday, April 27, 2019 from 10 a.m. - 2 p.m. in front of Ridley’s. Colored powder exploded at seven different stations throughout northeast Winnemucca as racers took to the streets for the Sixth Annual Color the Mucc 3K/5K event on April 13. Two hundred thirty participants each received a color packet and those who wore white were quickly covered in a rainbow of bright hues. The race — a partnership between the Humboldt County Chamber of Commerce and Humboldt General Hospital — began at the Winnemucca Community Garden and ended at Vesco Park with the Winnemucca Domestic Violence Services annual “Party in the Park." Car racing is back on track for the eleventh season at Lovelock Speedway. The next races are set for April 27 at 11 a.m. with the final race of the season scheduled for Sept. 21 at 7 p.m. The biggest races of the year are expected on Frontier Days weekend, Aug. 2-3. The schedule is subject to change, however. This year, the “Play Day” event scheduled for March 20 was cancelled due to rain that delayed work on the dirt track The track must be just right and work goes on throughout the season to maintain good traction, safety and dust control. During the April 15 Humboldt County Commission meeting a group of farmers and ranchers raised concern about water availability on land that is to be subdivided into 14 parcels. John Milton from Desert Mountain Surveying representing Finance All, LLC presented a Final Division of Land into Large Parcels Map showing the property located on Riata Road and one quarter mile east of Sierra Pass Road in the Silver State Valley. April is National County Government Month and each year since 1991 the National Association of Counties has encouraged counties across the country to elevate awareness of county responsibilities, programs and services they offer. This year’s theme is “Connecting the Unconnected,” and focuses on how counties deliver people-centered services to their residents. “It’s a shout out to the citizens to celebrate county government with us,” said Lander County Commissioner Patsy Waits. Rieko Shimbo unleashed a Japanese dragon at the community center on Saturday. “But if it bites you it brings good luck,” she told the children in the audience as she threw on a disguise. The creature’s jaws snapped as it eyed the front row for a good chomp. A few kids got the jitters. But within moments, the Montessori teacher from Tokyo, Japan, had every child out of their seats and drumming. 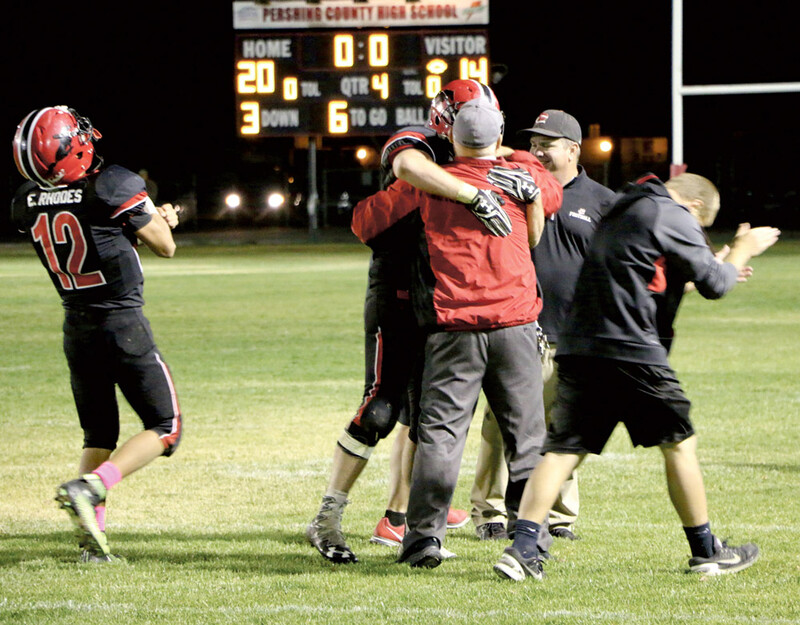 Ethan Rhodes (left) and Mike Brooks react to the score board while Tom Brooks hugs Ty Arnett and Dave McLean smiles after Pershing County beat Yerington 20-14 on Friday, in Lovelock. The win ended the Lions 29-game winning streak. In football, every game matters. If the opposing team is inexperienced, that gives the more seasoned team a chance to experiment. Everybody gets off the bench. Players try different positions on for size. Every year the Carson City Invitational track meet attracts top high school athletes from all over Nevada and California. On Saturday, April 20, over 30 teams raced, leaped and threw under cloudy skies at Carson City High. Pershing County High School sent over a dozen competitors. “It’s the best competition of the year,” said coach Lance Condie. He and Dave McLean co-coach the track team. On Saturday, April 20, Pershing bounced back with a vengeance. The final game of the series lasted eight innings, and ended with Pershing down by one point (7-6). The Lowry High School boys golf team went to the Ruby View Golf Course in Elko last Wednesday and came away with a third-place finish with a team score of 358. Truckee shot 336 for the team win, well ahead of second-place South Tahoe (356). Elko (360) finished fourth, Fernley (373) was fifth, and Spring Creek (389) and Dayton (471) rounded out the scoring. Birth information is provided by Humboldt General Hospital and not edited by staff. Births are provided by Humboldt General Hospital and are not edited by staff. Birth announcement content is provided by Humboldt General Hospital and is not edited by staff. Items in the Court Dispositions are compiled from public records contained in the Union Township Justice Court and the Sixth Judicial District Court. News4Nevada reports all felony hearings, misdemeanor convictions and dismissals for which the court releases information. When requested by the individual, N4N will post the person’s mug shot with their court disposition. Items in the Court Dispositions are compiled from public records contained in the Lake Township Justice Court. News4Nevada reports all felony hearings, misdemeanor convictions and dismissals for which the court releases information. Items in the Sheriff’s Report are compiled from public information contained in the Pershing County Sheriff’s Office report. News4Nevada reports all incidents about which law-enforcement agencies release information. Charges or citations listed in the blotter do not imply guilt, which is determined in court. Mug shots are provided by law enforcement as part of the public record. Persons arrested are presumed innocent until proven guilty.